Following the Council recommendation of 20 December 2012, EU member states set themselves the target of introducing systems for validating non-formal and informal learning by 2018. The intention is that competencies acquired at work, at home, during leisure time and on a voluntary basis are made visible by means of the validation procedure and can be used in the education and training system and in the job market. Such a system is yet to be introduced in Germany. Potential scenarios for the recognition of competencies have been developed and evaluated by experts in a BIBB research project. The article presents initial findings relating to the scenarios and to key aspects of the validation procedures. To date, initiatives for the validation of non-formal and informal learning have remained under formal recognition despite the fact that the need for implementation has been an established part of education policy-making decisions for many years. In order to clarify why this is the case, the control and self-regulation mechanisms which operate in the education and training system, and in particular within vocational education and training, need to be considered. The aim of the BIBB research project is therefore to identify perspectives and interests specific to institutions and stakeholders and to determine the necessary general conditions and chances of implementation. Initially, therefore, organisational requirements relating to procedures and validation tools for non-formal and informal learning were identified. Two different forms of scenarios were developed based on the approach of FINK/SIEBE (2011)1: Environment scenarios representing potential external non-controllable environmental conditions, i.e. modelling of societal and economic developments, and strategy options which set out various courses of action. These scenarios developed as strategy options presented below outline the specific validation procedures and instruments for the recording and documentation of competencies. a procedure supported by a qualification framework. In a two-step Delphi survey (cf. Information Box) scenarios were assessed by experts from various areas (cf. Figure 1). The aim was to ascertain and qualify the views of the interviewees (cf. HÄDER 2002, pp. 29 ff.). Of particular interest here was whether and how the assessments between the experts from the different stakeholder groups differed. The Delphi method is a structured group interview comprising several rounds for the assessment of future events, trends or technical developments. Following each round, information is shared and feedback is provided on outcomes in order that (anonymous) group communication can take place. The Delphi method is used primarily in future research, such as in assessment of technology or policy advice. 327 individuals were written to for the first round of interviews and of these 172 took part (a response rate of 53 %). The six scenarios were described in a 16-page questionnaire and each case was introduced with a case study. Experts were asked to assess the individual aspects of the procedures, the ease of integration in the education and training system as well as chances of implementation and desirability. Experts were also able to comment freely in each scenario. In the second round of interviews, participants were written to again and the response rate was 63 per cent (109 participants). The central questions relating to desirability and implementation chances of scenarios were again asked. The focus in this case was also on aspects which might prevent implementation of the scenarios. Comments from the first round of interviews were used to generate these questions. The questions were mainly closed questions with the option of commenting on blocks of topics. Of the six scenarios assessed, the majority of experts judged all to be desirable with the exception of one – the e-portfolio. By contrast, the assessment in terms of their chances of implementation is significantly lower (cf. Figure 2). The exception here is also the e-portfolio. For this, the chances of implementation were assessed as higher than its desirability. This scenario as well as the two most desirable scenarios (assessment of competencies and recognition of partial qualifications) are presented in greater detail below. Of the three scenarios addressing the recording and documentation of competencies, the scenario designed as a comprehensive and biographical assessment of competencies is the one with the highest desirability: 76 per cent of interviewees described their own level of desirability in this regard as (very) high (cf. Figure 2). Under this scenario, there should be an entitlement to competence assessment for all adults in Germany in 2030. These competence assessments are designed to be comprehensive and essentially biographical. In dialogue with appropriately qualified advisers, participants develop comprehensive documentation using both biographically-focussed methods as well as test-based methods such as personality tests. The competence assessments conclude with a confirmation following a uniform format equivalent to a detailed curriculum vitae. The competence assessments will be conducted in accredited assessment centres. In the view of the interviewees, the competence assessment is particularly suited to skills assessment and career planning. In contrast to desirability (76 %), the chances of implementation for 2030 are assessed as significantly lower. Just under half (49 %) regard this as “(very) high” This raises the question of the obstacles to implementation identified by interviewees. In the view of the experts, financial reasons in particular are an argument against implementation of the scenario described. 78 per cent are concerned that costs of processing will be too high. 67 per cent of the interviewees also anticipate that the level of confidence in the validity of the outcomes would be too low. However the methods used do not appear to be a determining factor in this. The mix of methods is assessed by almost 90 per cent of interviewees as (very) well suited. Comments from the open questions reveal a critical assessment of the procedure from some of the continuing educational training advisers, migration advisers and representatives from employer associations, even if this is for differing reasons. While some fear that a standardised process will result in too much focus on usability in the labour market, others have concerns that a biographically-focussed procedure will be too subjective. 66 per cent of interviewees regard the costs involved in creating a qualified advisory structure, as a further obstacle to implementation – this is, however, deemed to be necessary. Preparation of competence assessments in dialogue between participants and advisers is rated by more than 80 per cent as being (very) appropriate. The only scenario whose chances of implementation are rated higher than its level of desirability (cf. Figure 2) is the e-portfolio. Broad dissemination of this scenario is therefore more feared than desired. The e-portfolio scenario described an interactive online tool, funded by the EU, for the presentation of informal, formal and formal learning outcomes. The e-portfolio is created by users themselves and contains a broad range of content. Competencies from a range of different areas – from education and training institutions, from professional work and others – can be presented in various formats including videos. Users can also enter, for instance, certificates of formal qualifications, continuing education and training certificates and digital badges. In addition to the options for presenting your own evidence, the option for assessment by a third party is also available. The e-portfolio outlined is regarded as having strengths particularly in the area of skills documentation. Interviewees express concern regarding the demands which an e-portfolio places on users. 77 per cent of interviewees assessed the demands in terms of independent identification, documentation and presentation of competencies as too high and 69 per cent also felt demands placed on the media competency of users were too great. 87 per cent of participants in the Delphi survey were therefore concerned that well-trained and technically skilled individuals in particular would benefit from the procedure outlined. The provision of a personal advisory service to support this tool was met with broad consensus (93 % tended to agree). A further sensitive point relating to the scenario is data protection: 74 per cent of interviewees stated that this would not be adequately ensured. 99 per cent of interviewees felt that the holder would have to have full control over who could view their data and the extent to which this was possible. The option for integrating third party assessments, for example on a comment form or in the form of online questionnaires (for employers, associations etc.) was also met with cristicism. 55 per cent of interviewees also tended to reject the statement that, by 2030, the assessment culture would be so widespread and routine in the Internet that the rating of personal portfolios would be accepted. This scenario has the option for certification of parts of qualifications and outlines a low threshold intended to appeal to individuals who tend to be less familiar with educational programmes. Validation advisers accompany participants through the entire procedure and provide individual support. Individually certified parts of qualifications can be used directly in order to gain a foothold in the labour market or for an individual’s continued professional development. The vocational qualification is awarded if all partial qualifications are obtained within six years and the individual passes a final expert discussion with the examination board of the competent body. Of the three validation procedures described, this is the one favoured by the experts. 77 stated their desire to be (very) strong that this scenario becomes reality. As in the scenario previously described, the chances of implementation by 2030 received a significantly lower rating. These are considered as “low” or “extremely” low by 52 per cent. In the view of the interviewees, resistance, in particular, against the introduction of parts of qualifications from relevant stakeholders involved in education policy making prevents implementation of this validation procedure. 77 per cent of interviewees actually tend to agree to a validation that enables the attainment of partial qualifications. However, the views are very varied. While virtually 100 per cent of representatives from advisory services tended to agree, the equivalent figure among employee organisations is only 33 per cent. In terms of employer organisations and relevant authorities, in each case half tend to agree. A lack of capacity in the examination boards of the competent bodies is also viewed as a major obstacle to implementation. 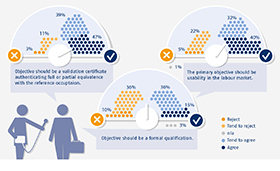 62 per cent of interviewees are concerned that demands placed on examination boards in terms of time required for the assessment of documented partial qualifications will be too great. 61 per cent of interviewees anticipate that coordination of the procedure will be expensive. Regardless of the individual scenarios, general pointers for successful implementation of validation procedures in Germany can be derived from the Delphi survey. 91 per cent of participants tend to agree that validation procedures would make a significant contribution to professional and personal development as these improve the assessment of one's own competencies. According to the interviewees, a procedure for recognition of non-formal and informal learning should be targeted at all interested parties and not specific target groups. This open approach also encompasses potential funding regulations. Public funding should be made available to all candidates. A majority of interviewees prefer practical methods for identifying competencies (e.g. simulation of work situations, observation in the workplace). In general, there is little support for the self-identification and documentation of learning outcomes. However, self-identification is regarded as useful in the preparation for a validation. 80 per cent of experts welcome identification and documentation of competencies extending beyond a reference occupation. The interviewees favour procedures which include a strong individual support structure and comprehensive advice (such as the validation procedure involving partial qualifications and the comprehensive competence assessment). 83 per cent of experts interviewed agree with the statement that validation procedures should offer the same level of advice and support to all candidates. Most interviewees oppose procedures which place high demands on the commitment and initiative of the user – such as the e-portfolio and the validation procedure for the attainment of a formal vocational qualification. For example, for both the former and the latter, 77 per cent and 73 per cent respectively agreed with the statement that the demands placed on users for identification, documentation and presentation of competencies were too high and that this might prevent implementation of this scenario. Huge importance is attached to data protection and data security. This represents a major challenge for technology-based procedures in particular. Data protection and also funding options are also linked to the issue of rights to ownership of outcomes. Does funding by employment agencies or employers, for example, mean that wide-ranging validation outcomes will be made available to them? The comprehensive competence assessment scenario includes the disclosure of a confirmation set out using a uniform format to funding parties such as employment agencies and is a contentious issue. In the second round of interviews this was supported by 47 per cent of interviewees, however more than half rejected the disclosure of outcomes. 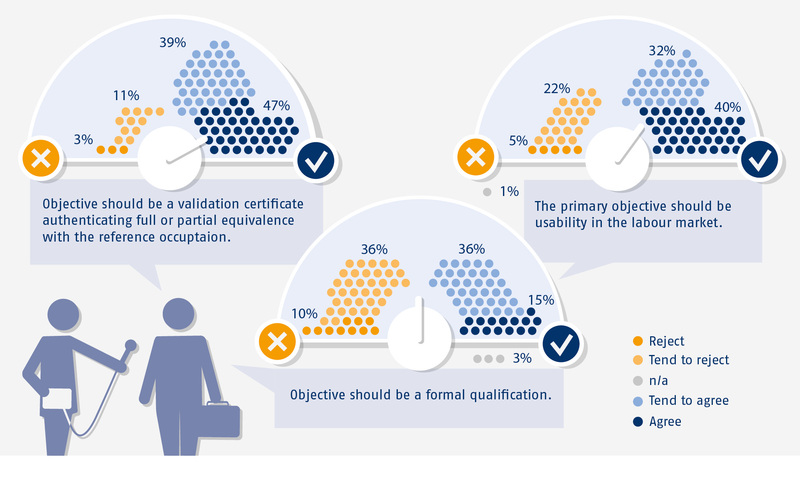 Usability of validation outcomes in the labour market is regarded by almost three quarters of interviewees as the main objective of validation. The majority also support reference to recognised qualifications. However, on the question of awarding formal qualifications based on validation, there are two almost equally large groups for and against. Consensus seems more likely to be arrived at on the awarding of validation certificates which authenticate full and partial equivalence with the reference occupation. 86 per cent of experts tended to agree with this objective (cf. Figure 3). 88 per cent of interviewees expect validation to provide a picture of individual competencies which is as comprehensive as possible but also a reference to recognised qualifications. A combination of procedures would therefore seem to be appropriate. The experts were also asked about this. They rated a combination of the comprehensive competence assessment with the validation of partial qualifications as the most meaningful. Taken as a whole, the following conclusions can therefore be drawn from the outcomes of the suvey. Procedures designed as comprehensive assessment of competencies as well as validation procedures with reference to qualification standards should be established and made generally accessible in Germany. While the strengths of the former are in supporting individual skills assessment and continued development, the latter focuses on recognition of competencies in the education and training system and on the labour market. In the case of both types of procedures, support and advisory structures must be created, interfaces outlined and funding instruments provided. A validation procedure also requires regulations for the certification of full or partial equivalence of competencies acquired with a reference occupation. As the project continues, the six scenarios assessed in the Delphi survey will be combined with environment scenarios. This will examine the question of how robust the individual scenarios are in the face of alternative environment scenarios. Based on the findings obtained, relevant stakeholders will be involved in a workshop in order to formulate potential courses of action and implementation recommendations for the introduction of a procedure to validate non-formal and informal learning. 1 For the approach taken in the development of both forms of scenarios, refer to the project interim report (in German) at https://www2.bibb.de/bibbtools/tools/dapro/data/documents/pdf/zw_42452.pdf (retrieved: 28.09.2017).